A Dragon in Alberta!? ABMI Vascular Plant Taxonomist Records New Orchid Sighting in Alberta. It was a day like any other when Varina Crisfield, the ABMI’s Vascular Plant Taxonomist, showed up for work at the ABMI’s Processing Centre at the Royal Alberta Museum*. Little did she know, she was about to achieve something few Alberta botanists can expect to do these days: identify a new species record for the province. 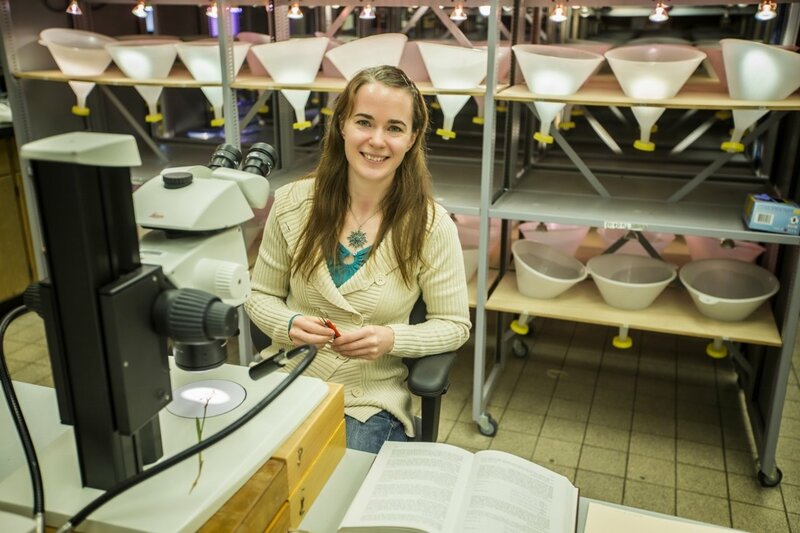 Varina Crisfield, ABMI Plant Taxonomist, Processing Centre. Photo courtesy of the Royal Alberta Museum. Decades of effort by biologists and naturalists across Alberta has resulted in an extensive list of species records for the province, making new discoveries a rare occurrence. When Crisfield verified her specimen hadn’t yet been recorded in Alberta, she admits she was excited for two days straight! To the untrained eye, Crisfield’s newly recorded species, Dragon’s Mouth Orchid (Arethusa bulbosa), looks somewhat similar to another species of orchid native to Alberta, called Venus’ Slipper (Calypso bulbosa). “Both species have similar looking showy pink flowers, but when compared closely, a few differences really pop out,” explains Crisfield of her discovery. 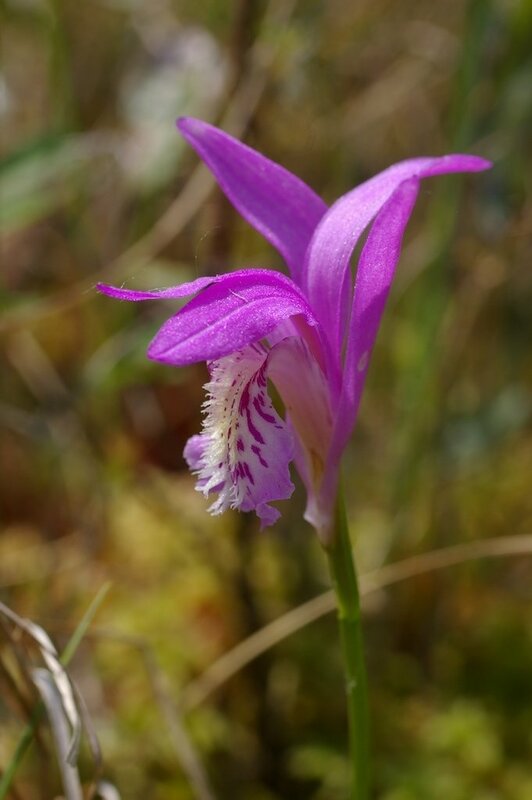 With the assistance of Caitlin Willier, an ABMI Aquatics Field Coordinator, and Joyce Gould, Science and Research Coordinator with Alberta Parks, Crisfield confirmed the pressed plant collected by ABMI Field Technician Lauren Law was in fact the Dragon’s Mouth orchid. Dragon’s Mouth Orchid is a native species with a wide distribution across North America that spans from Manitoba to Newfoundland and south to South Carolina. However, it tends to be rare throughout much of its range. 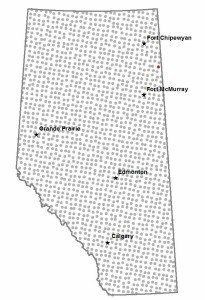 For example, in Saskatchewan, the conservation status of Dragon’s Mouth is listed as S1 (1), meaning it’s only known from five or fewer occurrences, or is especially vulnerable to extirpation (or, local extinction). 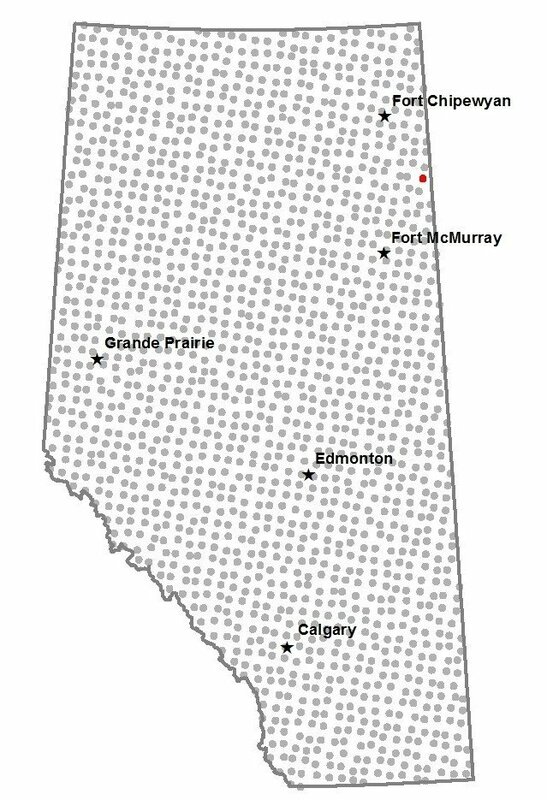 In the case of Alberta, although there have been previous reports of its occurrence, these were never confirmed or vouchered (collected, pressed and verified), and therefore Dragon’s Mouth was never added to the provincial species list. The ABMIs 1656 permanent survey sites. Sighting location of Arethusa bulbosa indicated in red. on reproduction by seed, which tends to be slow and often has low success rates in orchids. Humans may also have a negative impact on the survival of Dragon’s Mouth populations. Habitat disturbance, such as draining the peatlands in which the orchids live, and over-collection by orchid enthusiasts puts pressure on the already uncommon species. 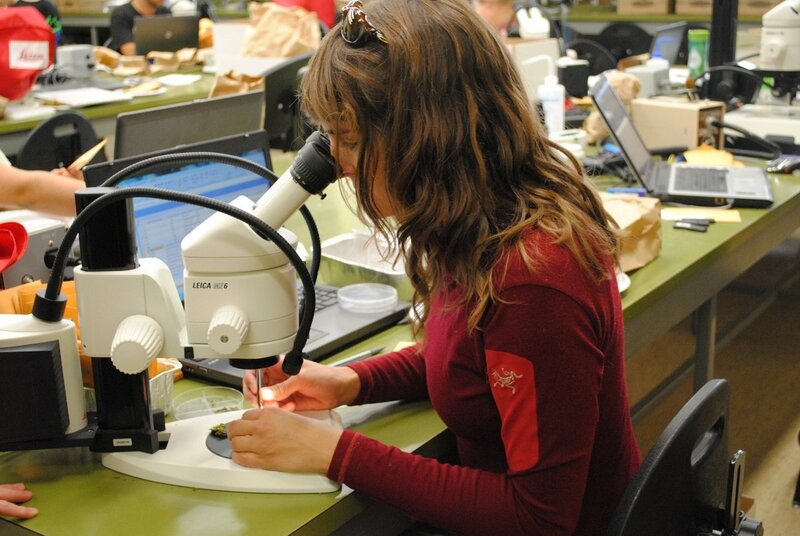 ABMI Terrestrial Field Technician, Mylène Francoeur, sorting and identifying specimens in the Processing Centre lab. In addition, Crisfield trains technicians in vascular plant identification, contributes to data quality control, and conducts primary scientific research. In this regard, Crisfield and her colleagues at the ABMI’s Processing Centre are working to reduce the “taxonomic impediment” in Alberta, a terms used to describe the global condition of inadequate taxonomic expertise and infrastructure required to fully understand global biodiversity. As Crisfield says, “Species are the basic units of biodiversity. To understand, manage and conserve biological communities and ecosystems, we first need to know and understand what their components are.” The discovery of the Dragon’s Mouth Orchid in Alberta supports this effort. Learn more about the taxonomic impediment to understanding and managing biodiversity at the ABMI’s upcoming Public Speakers’ Series: Better Environmental Management Through Monitoring. 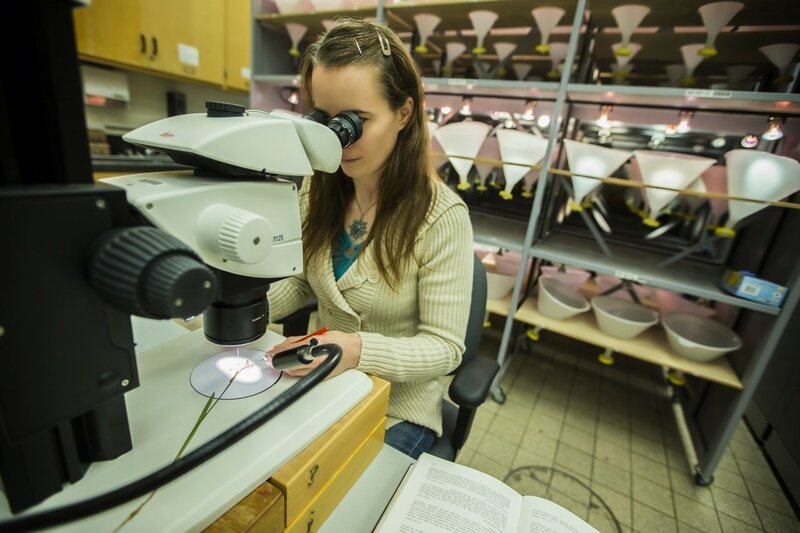 *The ABMI Processing Centre at the Royal Alberta Museum provides laboratory, taxonomic, and curatorial expertise for the Institute. The dedicated team of taxonomists and technicians is responsible for receiving, tracking, sorting and identifying field samples; conducting research; training new taxonomic experts; developing interactive and user-friendly species identification tools. Learn more about the Royal Alberta Museum and the Processing Centre here. Top Photo: Varina Crisfield at the microscope with Arethusa bulbosa. Photo courtesy of the Royal Alberta Museum.